In case you hadn’t noticed, one of California’s most spectacular fish is leaving us. The coho salmon, silvery favorites of fishermen and essential components of our coastal rainforest ecosystems, are headed for extinction in the state. This projection was made abundantly clear, at least to me, in a recent (August 16) State Legislative hearing. Personally, I will miss their dramatic presence. Forest streams will seem empty without them. I have been studying coho salmon for a long time. I caught and ate my first one in Alaska, in 1963. In 1976, I published my first account of them in my book on California fishes. Like every other biologist in the state, I thought they were doing okay. But now I realize that even then, the numbers of wild coho in California streams were tumbling downward. The reality of the decline hit me in the 1980s, when Larry Brown and I did a 5-year study of the Eel River watershed, sampling as many streams as we could. Despite the Eel’s reputation as a salmon producer, we found very few juvenile coho, even in prime locations. I asked various fish biologists about how coho were doing in other North Coast streams and generally got replies along the lines of, “Well, there don’t seem to be as many around here as there used to be. Of course, we aren’t looking very hard. But I understand they are doing okay in other watersheds. ” In the “other watersheds” answers were similar. So, Larry Brown and I acquired a small grant and did a quick assessment of their status. We estimated less than 30,000 coho were still spawning in California streams and only 5,000 of these fish were likely of entirely wild origin. 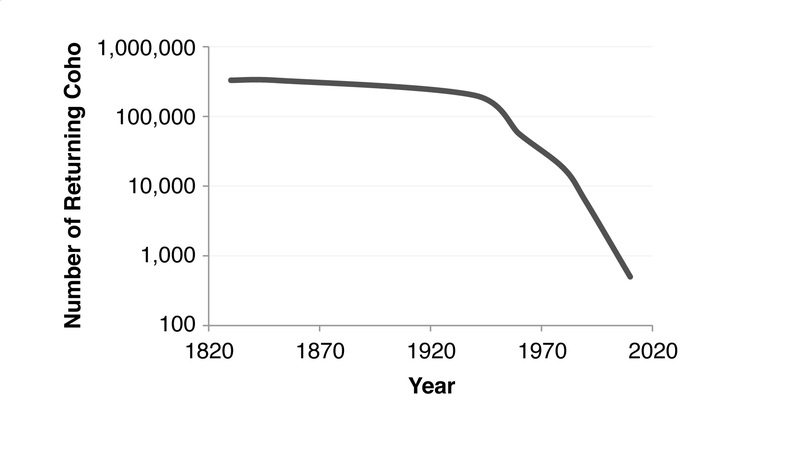 This represented a 90% decline in total numbers (Figure 1). The State and Federal fish agencies were skeptical of our results, but when they did their own studies they found the situation was just as bad as we had indicated. Ultimately this led to California coho salmon being placed on the endangered species list (1996). In the past three years (2008-2010), estimates by California Department of Fish and Game (CDFG) indicate somewhere between 500 and 3000 adult coho total returned each year to California streams, a 90% decline since our last study, meaning that at most 1% remain. They are virtually extinct south of San Francisco Bay. Coho numbers have continued to decline to the point where the coho recovery plan (NMFS 2007) is more of an extinction prevention plan than a plan for recovery. The rapid decline of coho salmon populations is indicative of what is happening to all species of salmon and steelhead in California’s coastal rivers. In the Eel River, for example, all salmon, including coho, have declined by 99% (Yoshiyama and Moyle 2010). Similar declines have probably taken place in most other North Coast rivers. Salmon in the largest of the rivers, the Klamath, are headed for the same fate. An analysis by Rebeccca Quiñones (2011) indicates that most salmonid populations in the Klamath Basin are in decline. Those that are not in decline appear to be increasingly supported by hatchery production rather than by natural reproduction. 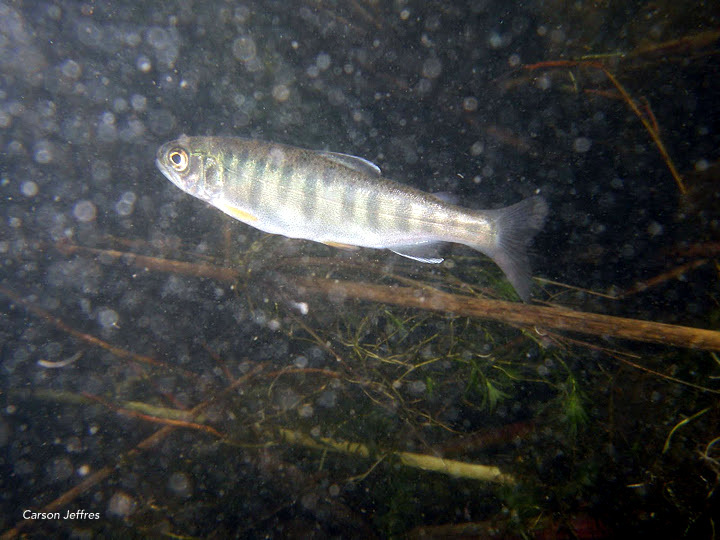 Coho populations, of course, are in particularly bad shape because they require cold, clear water flowing through complex channels in mature forests. All this means that actions taken to improve conditions for coho will likely benefit other salmon species, as well as a suite of native animals from insects to birds. Despite this dismal view, I still think coho have a future in California. My next blog “Coho in Crisis, Part 2: Saving coho, saving salmon, restoring streams” will explain why. Brown, L. R., and P. B. Moyle. 1997. Invading species in the Eel River, California: successes, failures, and relationships with resident species. Environmental Biology of Fishes 49: 271-291. Moyle, P. B. 1976. Inland Fishes of California. University of California Press, Berkeley, California. 405 pp. Moyle, P. B. 2002. Inland Fishes of California. Revised and expanded. Berkeley: University of California Press. 502 pp. National Marine Fisheries Service. 2007. Recovery Plan. Magnuson-Stevens Reauthorization Act Klamath River Coho Salmon Recovery Plan, Southwest Fisheries Science Center, 110 Shaffer Road, Santa Cruz, CA 95060. Quinones, R.M. 2011. Recovery of Pacific Salmonids (Oncorhynchus spp.) in the Face of Climate Change: A Case Study of the Klamath River Basin, California. PhD Dissertation, UC Davis. 129 pp. This entry was posted in Conservation, Fish, Restoration, Uncategorized and tagged California, Coho salmon, dam removal, fish migration, Moyle, salmon, stream restoration, UC Davis Center for Watershed Sciences. Bookmark the permalink.